CJ1W-MCH71 and CS1W-MCH71 Motion Controller Units with MECHATROLINK-II produced after August 2012 will have modifed labels. Underwriters Laboratories (UL) abolished the UL1604 ratings category for controllers used in hazardous locations, and Omron will modify product labels and stop packing slips with the product that reference that standard. UL508 still remains in effect, and all functions and performance of the product are not changed. Click here for more information about this product modification. Call Innovative-IDM today at 877.906.2100 to order your Omron MCH71 Motion Controllers! You have a malfunctioning AC Drive, Circuit Board, DC Drive, Servo, Controller, PLC or other industrial electronics part. Where do you send it for service? How do you determine which repair service depot is the best fit for your situation. Your choices are varied. You can send it to the OEM of the part, but many times the part is obsolete or the repair just too expensive – after all, OEMs are in the business of selling new parts, not necessarily fixing old ones. If the part still is under warranty from the OEM, this could be your best bet, however. Should you use your current repairs vendor? Or should you examine some new avenues for repair service? Most maintenance pros recommend that you have several quality vendors available to you for repair houses. That way, if Vendor A is backed up on turnaround time, you can have a backup plan and use Vendor B. If Vendor B doesn’t work on certain parts, then Vendor C does….and so on. If you doing some searching for additional help with electronic repairs, here are three important questions to ask prospective repair companies. Do you offer a NO CHARGE EVALUATION? Careful. Many services offer to “waive” the evaluation fee after you approve the repair, or to “subtract” the evaluation fee after you approve the repair. Fact is, paying for repairs evaluations is not necessary in today’s environment. You should be able to find a service that provides you with an evaluation whether or not you decide to eventually repair the item or not. Some services even offer online repair price lookup tools so you can ballpark a repair BEFORE you even send it in for evaluation. Be wary of terms like “Evaluation Fee,” “Bench Fee,” and other terms that may indicate that you have to pay to find out what’s wrong with your part. Ask these questions up front. Don’t pay for evaluations. Look for a repair service that will quote you a price, then offer YOU the decision what to do from there: Approve the quote, return the part unrepaired, or simply dispose of the part. The less hassle for you, the better. Does your repair warranty COVER THE COMPLETE PART? Repair warranty periods are a key factor in choosing a repair service. Make sure you are getting at least a one-year warranty on the repair and also make sure the warranty covers the ENTIRE PART and not just the repaired area of the part. Some electronic repair companies will only cover the repairs they made, and you can negotiate a better deal than that for sure. After all, remember that repairs are just another term for “troubleshooting” and even the best repair services can, on rare occasions, miss on a bench diagnosis. The good repair houses, however, will minimize the chance of this happening by performing additional testing on ALL AREAS of the part after the repair is made. That means they will check for loose wires, weakened components, testing under load and will generally inspect and clean the part to ensure it’s in true working order before it ships back to you. What is the turnaround time for my repair? Always the crucial question: How long will it take to repair my part? Again, ask this BEFORE you send in the part. Most electronic repair companies have published turnaround times. Some even offer Expedited and/or RUSH services for emergency situations. These rush turnarounds will cost extra, but it may be worth moving to the head of the line no matter what the cost if you are in an emergency situation. The company you want is the repair depot that will under-promise and over-deliver. That is, they publish a 7-10 day turnaround and you get your part back in five business days. That rocks, but you’ll have to take a leap of faith and try a service before you’ll have a good feel for their delivery habits. First impressions mean a lot, so hold the company to their turnaround promise. Remember, too, that when you are asked to approve a quote for repair, you’re doing yourself a big favor on turnaround time if you approve that quote as soon as you make the decision. Asking these 3 questions can help your evaluate how a repair service facility will perform for your needs. It doesn’t take much time to ask these questions in advance, and it will save you a lot of time and headaches later down the line. Repairs already keep you awake at night: Choose a repair service that makes repair submissions easy (preferably an online tool), does not charge for evaluations, has a warranty on the repair AND the entire part, and offers turnaround times that fit your needs. If you need to cut through the red tape on these issues quickly, call Innovative-IDM’s Electronic Repair services at 800.237.3278 or go to www.innovativeidm.com/repairs. Buzz Welcomes Tim Addison to Innovative-IDM! 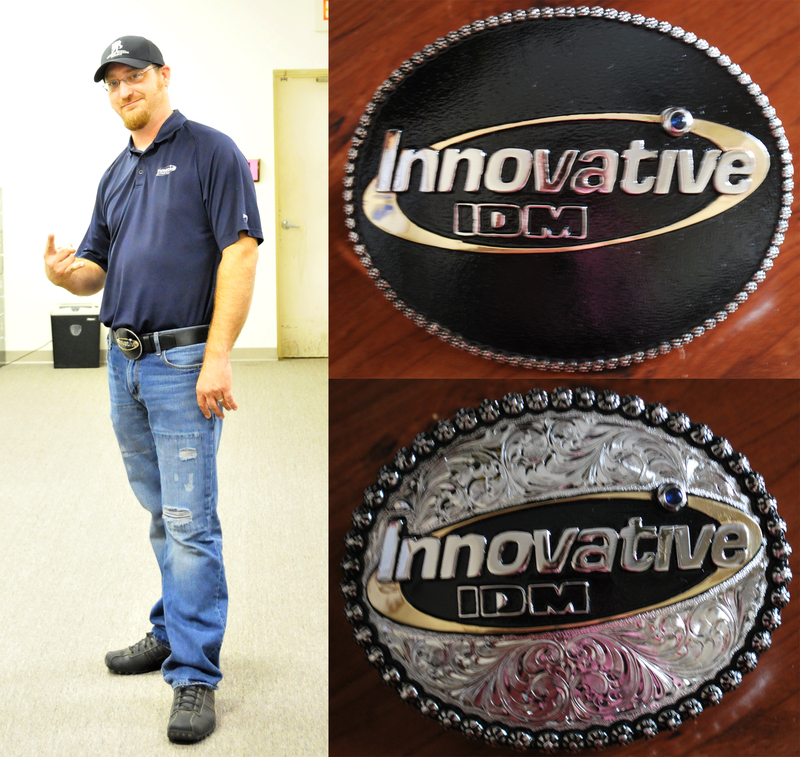 Tim joins Innovative-IDM after 6 years with Texas State Energy Corp. in Plano, Texas. and 1 year with US Health Advisors in Dallas. Although he is a native of Red River, N.M, he grew up in Plano and studied Human Sciences at Tarleton State University in Stephenville, Texas. 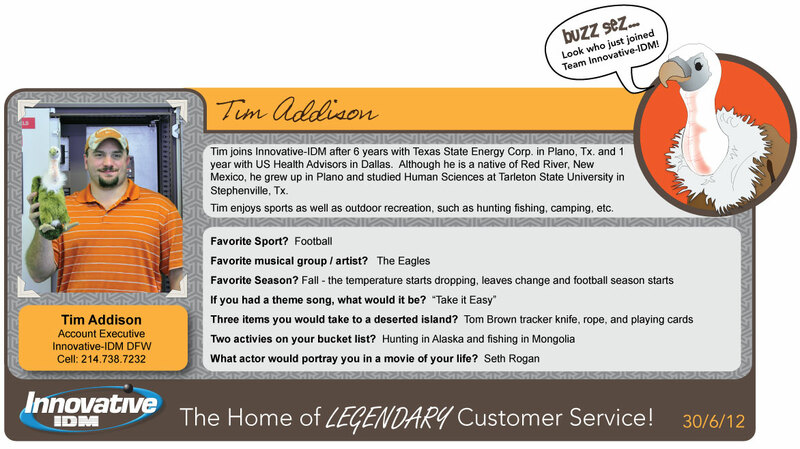 Tim enjoys sports as well as outdoor recreation, such as hunting, fishing, camping, etc. “Over the past 12+ years Michael Mueller has held and excelled at several positions with Innovative. It all started in the VAS Shop as a wireman, then he was promoted to VAS Shop Manager. Next stop was working as a Customer Service Representative for several years before being promoted to Customer Service Manager. There was even a stint with the Outside Sales Group mixed in the middle. 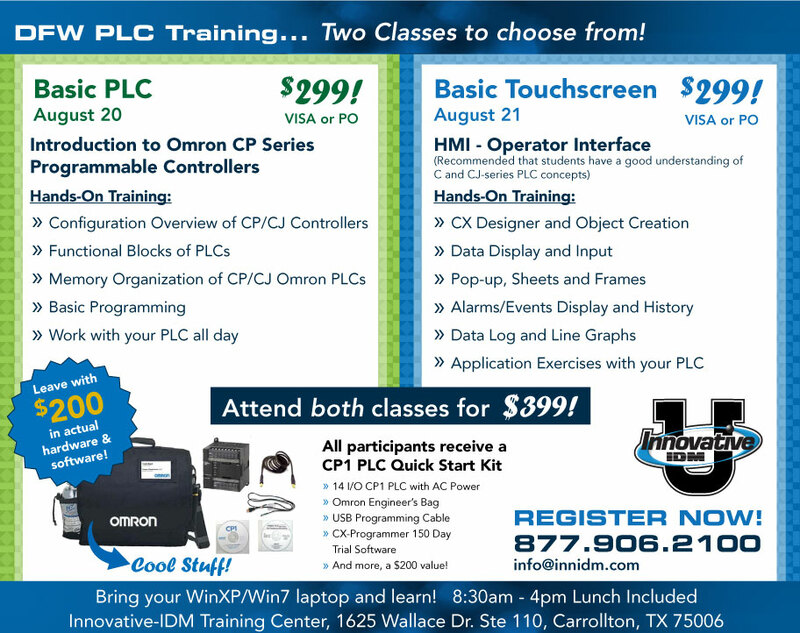 Omron PLC training is coming back to DFW on August 20 and 21! This time we are offering the Basic PLC class on Day 1 and a Basic Touchscreen class on Day 2! Seats limited to 12 – reserve your seat today! How easy is it to sign up for DFW Omron PLC training? Give us a call at 877.906.2100 or send us an email at info@innidm.com and sign up NOW. The P1000 drive provides simple, reliable, cost-effective control for variable-torque loads through 500 HP. Specific application features, energy savings, and network connectivity make the P1000 a great choice for industrial fans and pumps. Click here to go to our Knowledge Center, where you can find the Yaskawa P1000 catalog and brochure! Order your P1000 Variable Speed Drive today – call Innovative-IDM at 877.906.2100 or send us an email at info@innidm.com. Omron W-Series Servos R88D-W/R88M-W will be discontinued March 2013. Recommended replacement is the G5-Series servos R88D-K/R88M-K. Click here for more information and a list of affected parts and recommended replacements.